EXECUTIVE ACCESS: WaterSound guests staying at this property have complimentary access to the WaterSound Beach Club, 3 community pools (including the 7,000 square ft zero-entry pool at the WaterSound Beach Club), the use of two kayaks or canoes for one hour per day, as well as 20% off stand up paddle boards at the WaterColor Boathouse. For an additional cost, they also receive full access to Shark's Tooth and Camp Creek Golf Courses, the WaterSound Fitness center, and 2 tennis courts at both Shark's Tooth Club and the WaterSound Beach Club. DETAILS: Every now and then you come across a home that takes your breath away. So it is with “Time of Your Life,” a 6-bedroom, 6.5-bathroom WaterSound home with a private pool, extraordinary outdoor spaces and stunning Gulf views. 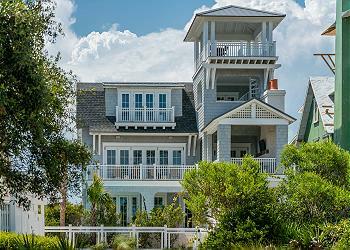 Beautifully designed and perfectly thought out, this coastal home combines style with comfort. Take your morning tea up to the fourth-story crow’s nest before a day spent at the world’s most beautiful beaches. Gather with friends and family in the evening around the hearth of the gas fireplace and a flat-screen television on the covered deck. All of the fun of 30A awaits just beyond the gate. The chef’s kitchen features designer cabinets, marble countertops and select stainless appliances, including a gas range. The dining area offers seating for 8 under a beautiful candelabra-style fixture, while the kitchen island has seating for an additional 4 guests. Table seating out on the deck can accommodate another 4. The living room has a flat-screen television, a timber beam ceiling, window transoms and access to the balcony. Open the doors and the living room becomes an extraordinary outdoor room. The private pool offers a partially covered patio area, creating a wonderfully intimate setting. The first floor has a guest bedroom with a king bed and private bathroom with a shower/tub combo. Adjacent are two more guest bedrooms, both with king beds and private bathrooms with showers only. Ascending the staircase to the second floor you’ll find another guest bedroom with a king bed and private bath with shower only, along with a bunk bedroom with 2 twin-over-twin bunk beds and private bathroom with a shower/tub combo – the perfect quarters for the little ones. The third floor has a gorgeous master bedroom with a king bed and private bathroom with a shower and soaking tub. “Time of Your Life” can accommodate up to 14 guests. The outdoor spaces are what truly set this home apart, and the crow’s nest is perhaps the most stunning. Share an evening of cocktails with family and friends as you take in an amazing view of the Gulf and the rooftops of the surrounding neighborhood. Of course, the amazing amenities of WaterSound, including the zero-entry pool and Beach Club, are here for you to enjoy. Book “Time of Your Life” with 360 Blue today!